Sept. 19, 2017, 5 a.m.
By Everette E. Dennis and Robb Wood Sept. 19, 2017, 5 a.m.
Editor’s note: Everette E. Dennis is dean and CEO of Northwestern University in Qatar. Robb Wood is director of strategic partnerships. Arab nationals are more likely than Americans to get news from social media, and younger Arabs are more likely to trust it than their older compatriots. These are some of the findings from the fifth annual Media Use in the Middle East survey conducted by Northwestern University in Qatar (NU-Q). The studies, which were launched in 2013 to chart people’s media use and involve more than 7,000 subjects, are the most extensive surveys of their kind and among the few such regional longitudinal studies in the world. The study covers media use and public opinion in seven key nations in the region: the United Arab Emirates, Lebanon, Saudi Arabia, Jordan, Qatar, Tunisia, and Egypt. (Egypt was surveyed in June and July 2017, five months after other countries, and is not included in regional average figures.) Data for the other six countries was collected prior to the diplomatic blockade of Qatar and thus predates recent PR and information wars in the region. In a region grappling with issues of an evolving and often restricted media system, there may be signs for encouragement in the high levels of use — and, among more sophisticated users, trust — of news from social media. Smartphone ownership in the countries surveyed is extremely high — 84 percent overall, with more than 9 in 10 nationals in Lebanon, Qatar, Saudi Arabia, and the UAE owning a smartphone. Over three-quarters of nationals get news on their phones, second only to news on TV. 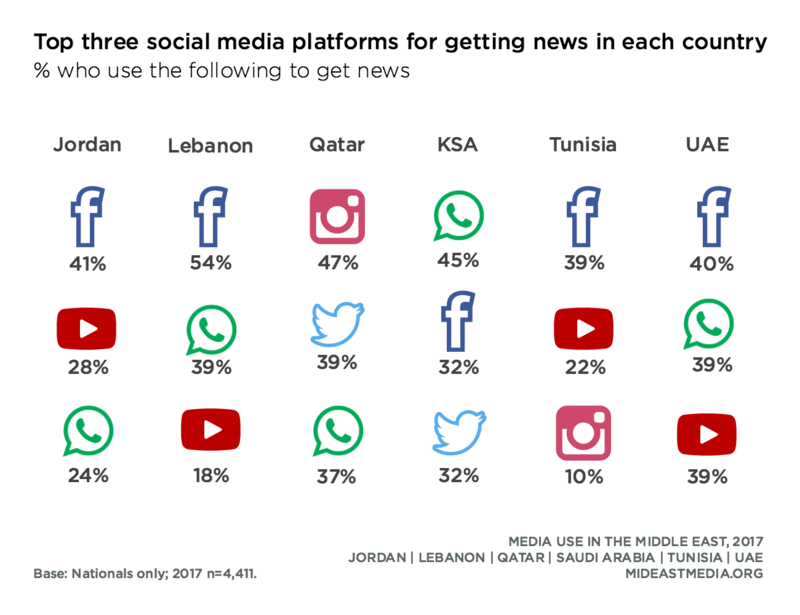 A recent Pew study reported that two-thirds of Americans say they get at least some news from social media, including 20 percent who say they do so “hardly ever.” In the NU-Q survey of the Middle East, two-thirds say they get news from social media every day. Eight in 10 Arab nationals (79 percent) say they get at least some news from social media. The Middle East and the U.S. have similar rates of Facebook penetration and similar rates of users who get news on the platform. This is despite a general decline in Facebook use in the region, led by sharp declines in the Gulf. Since 2015, Facebook usership dropped in Saudi Arabia (76 to 55 percent), United Arab Emirates (83 to 70 percent), and Qatar (43 to 22 percent). Overall, 40 percent of those in the countries studied get news from Facebook. But there are also stark differences between these countries and the United States. 67 percent of Arab nationals use WhatsApp, and 28 percent of the total population gets news from the platform. Pew found that only 11 percent of Americans use WhatsApp, and only 2 percent say they get news that way. Use of video-first, closed-network Snapchat is divided between the high-connection-speed, privacy-concerned Gulf countries and the rest. In the Gulf, usership is more than 50 percent, while in non-Gulf countries it remains below 20 percent (in the U.S., it’s 18 percent). News use on the platform is similarly divided — far more Snapchat users in the Gulf use it to get news (55 percent in Qatar, 51 percent in United Arab Emirates, and 37 percent in Saudi Arabia). Trust in mass media is high. 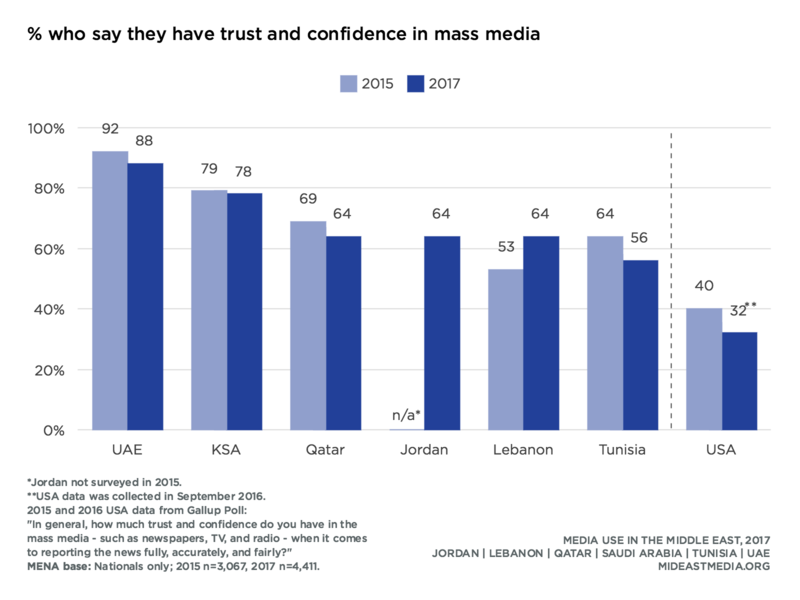 Overall, Arab nationals are twice as likely as Americans to trust mass media. This level of trust is generally consistent across age groups and education levels. When asked about trust in news from social media, the picture changes. Trust in news from social media is lower, at 47 percent region-wide. And gaps appear between age groups. 50 percent of adults between 18 and 24 trust news they get from social media, compared to 36 percent of those 45 and older. People who trust news on social media are not only younger, but also better educated. Of those who have at least a high school-level degree, 50 percent say they trust news from social media; among those with less than a secondary degree, 36 percent trust news from social media. Might it be that the people who say they trust news from social media are not ignorant of or indifferent to quality information, but in fact are more sophisticated users of social media, with better-curated feeds containing more reliable sources? Social media and mass media are not mutually exclusive. Traditional journalism outlets rely heavily on social media referrals for their site traffic if they even still bother to try driving traffic to their websites at all. All respondents are still more likely to say they trust mass media than social media. It’s just that news from social media is more likely to be trusted by younger, better-educated people — which is to say more native, sophisticated users of the medium. The report is conducted each year with multiple purposes in mind — as an impartial assessment of media use aimed at academics, industry professionals, and others. The data are also contributed to the World Internet Project, conducted by the USC Annenberg School, of which NU-Q is a member. In a region where censorship and free speech can be controversial, the study is used as a template for discussion and debate that might not otherwise be encouraged. Findings reflect nationally representative samples of over 1,000 respondents in each country. Interviews were conducted face-to-face in most countries, and by phone in Qatar. The study was led by Northwestern University in Qatar Dean and CEO Everette E. Dennis and researchers Justin Martin and Robb Wood. Field work was done by the Harris Poll. 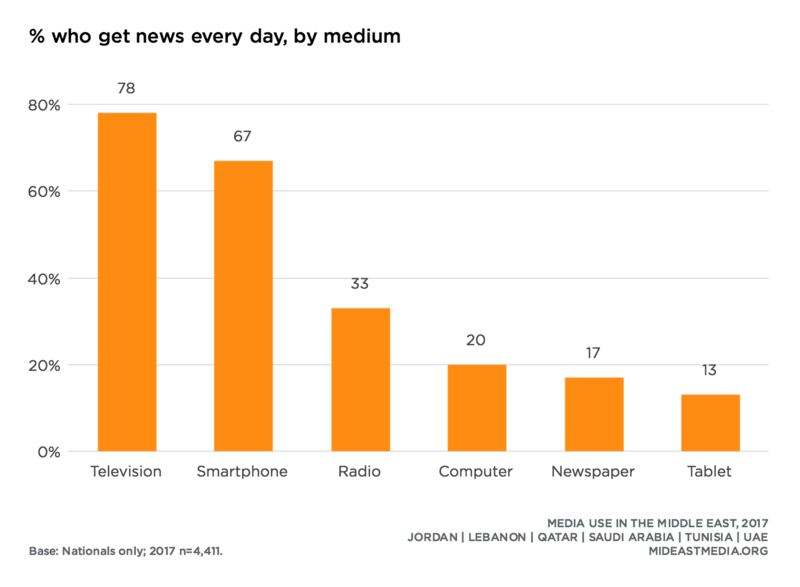 POSTED Sept. 19, 2017, 5 a.m.
Dennis and Robb Wood, Everette E.. "Media in the Middle East: A new study shows how the Arab world gets and shares digital news." Nieman Journalism Lab. Nieman Foundation for Journalism at Harvard, 19 Sep. 2017. Web. 19 Apr. 2019. Dennis and Robb Wood, Everette E.. "Media in the Middle East: A new study shows how the Arab world gets and shares digital news." Nieman Journalism Lab. Last modified September 19, 2017. 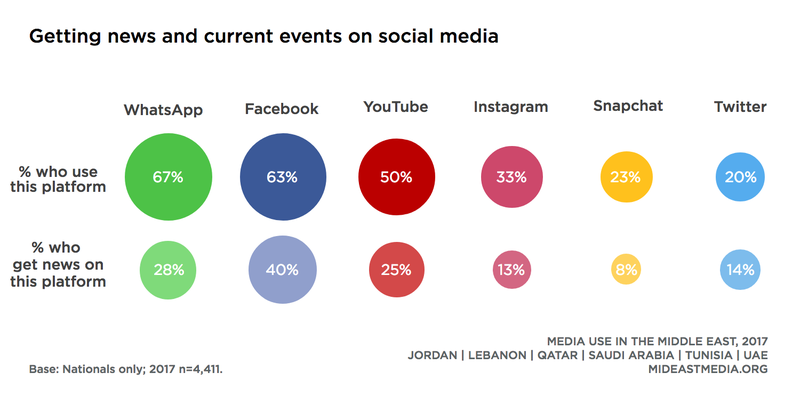 Accessed April 19, 2019. https://www.niemanlab.org/2017/09/media-in-the-middle-east-a-new-study-shows-how-the-arab-world-gets-and-shares-digital-news/. | first = Everette E.